When talking to couples that are planning an NYC wedding, one of the main topics of conversation is where to go for portraits. 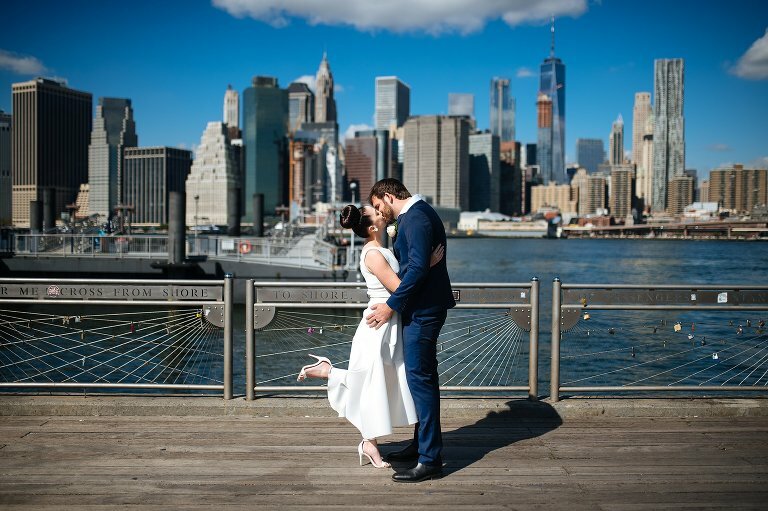 With DUMBO being the most popular neighborhood for the past few years, most couples are specifically asking, “What are the best wedding photo locations DUMBO has?” Even though that might be the hotspot right now, the more broad question is always at play — where should we go for wedding photos in the city? In that spirit I’m going to start highlighting some neighborhoods throughout New York City that are great options for exploring on your wedding day. Because I am a location-based wedding photographer, the city is our studio and we can literally go anywhere and create amazing wedding photos. Each neighborhood lends its own character into the look and feel of the photos, so choosing the right location for the type of wedding photos you want is definitely something to consider. 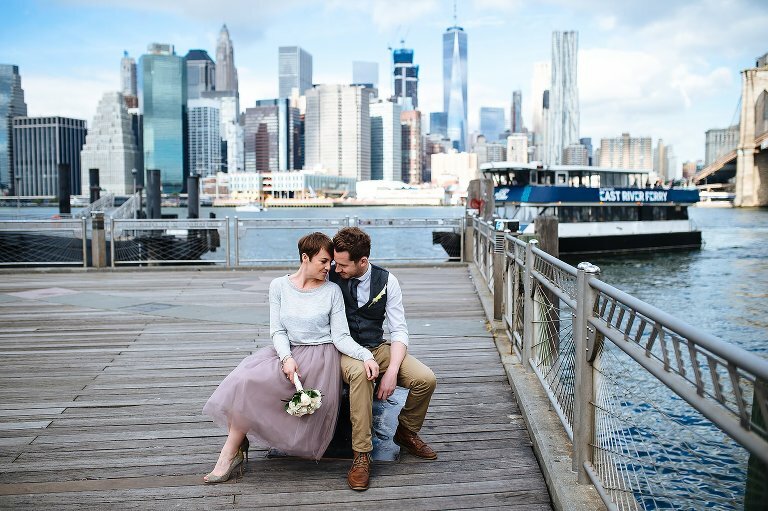 Why you should go to DUMBO for wedding photos. The skyline views alone are worth the trip over, but step away from the waterfront and you’ll find a striking neighborhood with cobblestone streets and converted industrial warehouse buildings. I love any neighborhood that offers a lot of options because it means that we can create lots of variety within a short walking distance. With a little bit of everything, DUMBO has a long list of photo spots worth checking out. This waterfront Brooklyn neighborhood is nestled between the Brooklyn and Manhattan Bridges (hence the name, Down Under the Manhattan Bridge Overpass). It includes the north end of Brooklyn Bridge Park, along with Jane’s Carousel, the most photographed block on Instagram, and a former industrial neighborhood peppered with boutique shops and converted lofts. What are the best wedding photo locations DUMBO offers? 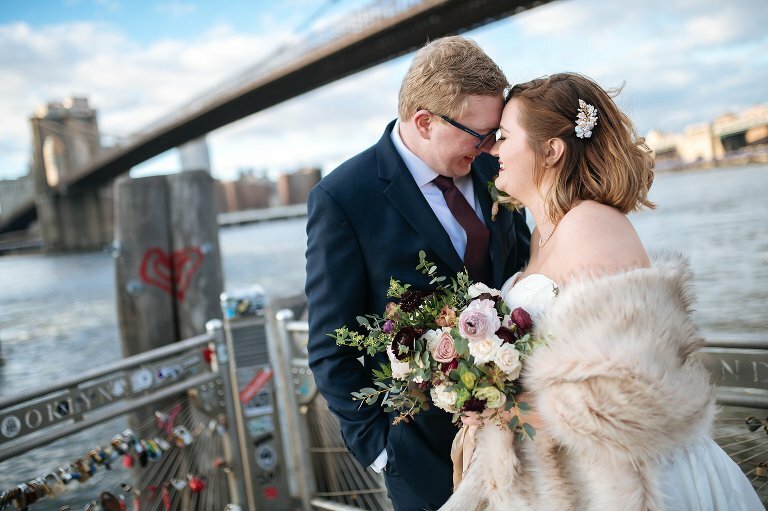 There are lots of great nooks and crannies to explore in DUMBO, but there are three key areas that I try to visit with every wedding couple. While technically not part of DUMBO (but it’s *right* there! ), this ferry landing holds the iconic skyline view of the area. It looks straight across to downtown Manhattan, while the span of the Brooklyn Bridge soars past you to the north. Ferries come and go along with tourists who snap photos, but it’s never too hard to capture some photos where it’s just the wedding couple with no one else around. A must visit! If you love the waterfront but don’t want all of your photos to have skyline views, these are two great areas to explore for some variety. Jane’s Carousel is a restored, fully functional carousel. You don’t even have to ride it to take advantage of it for photos, but why wouldn’t you ride a carousel? The two converted warehouses on the waterfront are actually old tobacco storehouses. They finally received some love and care and have been recently reopened, including an elevated public space and a ground-level garden. The first one might be well known, but this one is actually all about the nooks and crannies! DUMBO is a great neighborhood for exploring random blocks, so let your feet you lead you somewhere exciting. The BQE Wall is a colorful piece of graffiti along the wall supporting the Brooklyn Queens Expressway (from the 2013 DUMBO Walls project). The “Rust Wall” is just the side of a random building I found a few years ago while exploring back in the neighborhood. The City Hall elopement of Mary & Joreal was such a great intimate wedding! After their City Hall ceremony, we hopped across the Brooklyn Bridge and explored DUMBO for their wedding portraits. The loop we made covered most of the best wedding photo locations DUMBO has! This Frankies 457 wedding day started at the 1 Hotel Brooklyn Bridge, at the south end of DUMBO. After a first look, I explored DUMBO with Katherine & Quin for some fun wedding photos. What neighborhood should I feature next? New York is such a wonderful city to explore, especially on your wedding day. Do you have a favorite neighborhood you’d like featured next? Let me know!